It’s the height of the trail running season here and with many high profile races coming up in the Chamonix Valley such as the UTMB, Evergreen Endurance Triathlon and Trail Aiguille Rouges just to name a few, we thought we would give some inspiration to those flooding here from around the world on how to be a Super Supporter. A supporting crowd can do wonders and work miracles for those running these extremely challenging races… especially ultra distances. So whether you are following a specific runner in the form of friends or family or just here to provide a bit of morale to all those runners needing a little lift, we have a few tips for you to try. Supporting is thirsty work, so be prepared. Pack more than enough food and drink to get you through the entire day taking into account possible weather conditions. If you are supporting a friend or family member ask them if there is anything specific they might like to help them during the race on route such as specific gels, sports drinks or snacks. And if you want to be a ‘Super Supporter’ have some sweet or savory treats ready for passing runners such as jelly babies, orange slices, pretzels or nuts. With most of the larger races keeping up with the times, nearly all have some sort of runner tracker or mobile app to keep an eye on the runner in your life’s progress. It’s a good idea to have an occasional glance at their progress not only to make sure you do not miss them or unnecessarily worry about where they are, but also to help encourage them appropriately when they pass by. This might sound strange but although you are not running the race if you’re supporting a runner you are probably going to be running around after them. Whether that’s to fetch things for them, running from one spectator point to another, or just to simply beat the queues of people also there to support. So perhaps leave the high heel stilettos or your high end fashion attire at home for this one. Dress for speed and have the right gear to cope with all plausible weather conditions you might be faced with throughout the day. Runner’s appreciate many different types of morale! Whether it’s a funny joke, motivational quote or a simple “Bravo” or “You’re doing great!” Get into the spirit and start cheering, clapping or use percussion instrument of some kind. Drums, cow bells, ratchets, whistles and Vuvuzelas are all fair game at the races and on the trail. For international races why not brush up on your languages and get a few motivational words of encouragement in a couple of languages… competitors really appreciate it. It’s surprising how a simple sign can really break up the monotony of a race and bring a huge amount of morale. If you know any specific runner competing try to incorporate their name or nick names onto a sign to personalise it and bring a rye smile. If possible before the race starts let the runner in your life know where you will be and what you will be wearing (errr….not in that way!) so they know where to look for you. In terms of dress code the brighter the better in my opinion! Stating the obvious I know but lets face it, some of us can get caught up in the moment and perhaps a little obsessive at finding or supporting our runner that sometimes we forget about fellow competitors and the rules. One good way of being respectful of the course is to not stand on it and give runners plenty of room to make their way through. The last thing a runner needs is to weave in and out of spectators on an already crowded trail. If you can’t see in your current location why not try an alternative? Providing aid or support in undesignated areas of the course which has been prohibited. This can include providing nutrition…yes, even just a couple of Jelly babies! And also taking equipment such as poles off runners which need to be carried for the entire race (should they opt to use them). Some races do not allow pacers, friends or family to run with competitors for the entire route or specific parts of the route. We have all heard the saying “failure to plan is planning for failure”. Well unless you know the route and local area like the back of your hand it worth doing a little research before the day for potential supporting spots along the route and nearby facilities to help your day run smoothly as possible. As you can imagine there are going to be plenty of fellow supporters looking to do the same as you so leave plenty of extra time to allow for this. Even if it’s just to reduce your stress levels. If any of you have been to a race before you certainly know how chaotic and crowded a finish line and surrounding areas can be. So in case of a breakdown in communication due to a lack of phone or signal its best to have a very specific plan of where to meet after your runner has finished. To be a super supporter meet them armed with snacks, treats and fresh clothes. Plus anything else you think they might want or need. So there you have it! Peak Transfer’s tips on how to be a Super Supporter. Good Luck to all those who are taking part in any of the upcoming races of the mighty Ultra trail du Mont Blanc, gruelling Evergreen Triathlons and challenging TAR races. Supporters can make a race that extra special not only for the competitors but also the for the atmosphere of the whole event. 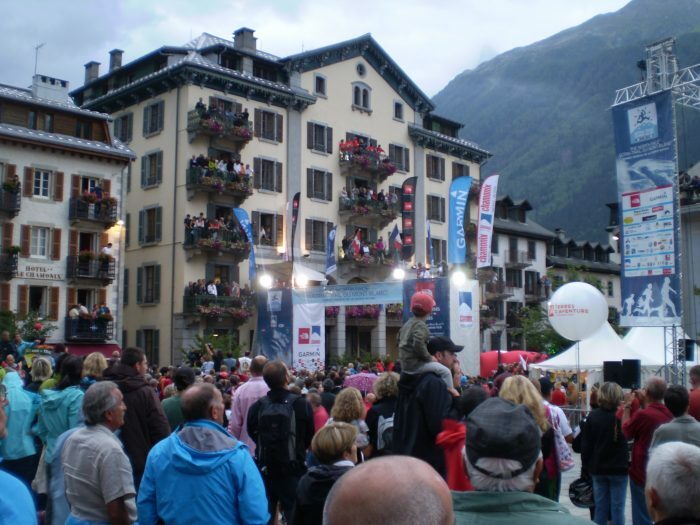 It’s why races such as the UTMB are world renowned. We would also like to say a big thank you to everyone that has signed up to volunteer at these big events as they could not take place without you. Check out the websites for more information regarding the UTMB, Evergreen Endurance Triathlon and TAR.